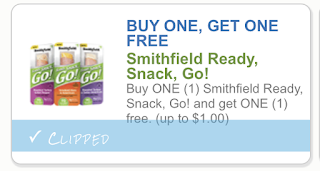 BOG Smithfield coupon and deals at Target, Walmart and Meijer! These are priced $0.97-$1 at Target, Walmart, Meijer, Kroger and more store! If they are ion sale then get them for a lot less, but otherwise pay $1 for 2, that's $0.50 each!